Conserving the scenery, wild life and the natural and historic objects of the Fells Reservation while ensuring their enjoyment by the public is a challenge which invites active participation and engagement by visitors. There is a lot we can do to help preserve the beauty of the Fells! Saw something of concern? 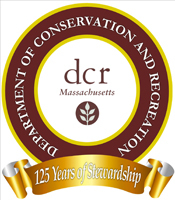 Click to find out how to contact DCR ParkWatch. The Massachusetts Department of Conservation and Recreation Park Watch program was established in 2011 to “encourage crime prevention practices by park staff, law enforcement, and park visitors to ensure a safe and crime-free park environment.” The program is meant to track and discourage common illegal activities such as illegal dumping, vandalism, alcohol consumption, fires, off-trail use, off-leash dogs, bicycles on pedestrian-only trails, motorized vehicles on trails, paintballing, hunting or trapping, etc. If you witness any of these activities (or evidence of the activities), you may call the ParkWatch line at any time (24 hours) to report them: 1-866-PK-WATCH (866-759-2824). Consider programming the number into your phone so that it will be there when you need it. Phone number where you can be reached (if you’re comfortable giving that info). Do not get involved in trying to address these enforcement issues yourself, but rather (if you carry a cell phone) promptly, but discreetly, call the Park Watch number. You may feel uncertain whether a given concern is “worth” calling in to the line. In the words of one DCR ranger, “It never hurts to call things in.” Whether you see an illegal activity in progress, or a site that was disturbed (by dumping, fire, etc) many months ago, please make the call. A call log showing significant activity will help to lobby for additional rangers and support staff to be assigned to the Fells. The call log helps guide the attention of DCR managers and rangers to the areas that require maintenance or monitoring. If an issue is not promptly addressed, repeated reports over a period of time will ensure that it is escalated in priority. Repeated calls regarding one area may indicate that efforts made to maintain that area are being actively undone, which is valuable information. ParkWatch is not an emergency line. Any emergencies or dangerous situations should be reported immediately to 911. 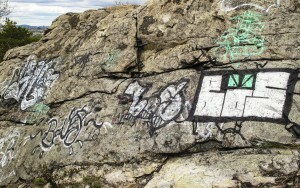 Graffiti is vandalism caused by a small minority that is scarring many of the most scenic areas of the Fells. Visitors to scenic overlooks for example find that their experiences are marred by the ugliness of graffiti painted on the ledges. Like a noxious weed, if not removed graffiti will expand as sites become identified as key targets for continued tagging. Restoring spray painted natural and cultural features is an extremely time consuming and expensive task for the Department of Conservation and Recreation and the Mass Water Resources Authority. Once removed it is important that new graffiti activity is reported and documented as quickly as possible so it can be cleaned up thoroughly and immediately. Having these impacted areas ‘adopted’ by volunteers for monitoring, reporting and restoration will make a big difference. Human caused fires damage and destroy natural resources and animal habitats in the Fells and pose serious threats to residences that border the Reservation. 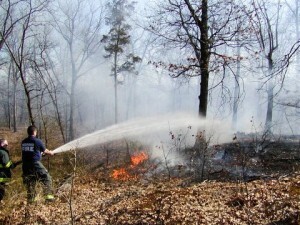 Extinguishing fires in the Fells requires tremendous expenditures of municipalities’ human and material resources. Prevention is the most cost effective remedy and includes identifying and reporting fire pits associated with party areas so the sites can be cleaned up and restored to a natural state. Quick response to fires is critical for minimizing their expansion. Fires can be reported to ParkWatch at any time (24 hours): 1-866-PK-WATCH (866-759-2824) and should be reported immediately as an emergency to 911. The Department of Conservation and Recreation welcomes dogs with their owners at the DCR Middlesex Fells Reservation. For the safety of visitors and other dogs, and protection of the environment, DCR has established uniform rules and behaviors. These include a maximum of three dogs per person, with dogs wearing a collar and on-leash — with the exception of the designated area of the Sheepfold where dogs may be let off leash. To ensure pleasant experiences for all Fells visitors it is the responsibility of each dog owner to clean up after their dog and to properly dispose of waste at a location away from the Reservation. The Mass Audubon Society has determined that the Fells is an Important Bird Area (IBA) because the Reservation provides essential habitat to breeding, wintering, and/or migrating birds. Thus, keeping dogs under control and leashed is important for the preservation of significant bird populations or communities. Similarly, allowing dogs to swim in Fells vernal pools and ponds is harmful to the habitats of a wide range of aquatic species. Spot Pond, the High Service and Winchester Reservoirs provide fresh drinking water resources to residents north of Boston. To protect these public supplies No Swimming regulations apply equally to humans as well as dogs. Mountain biking in the Middlesex Fells allows the off-road cyclist the use of all “Fire Roads” or “Forest Roads” throughout the Fells. In addition, a designated Mountain Bike loop trail offers riders a loop path around the Western Fells. This trail is marked by “Mountain Bike Loop” signs and blazed with green rectangles. This loop trail is about 85% on fire roads and 15% on a single-track trail. Bikers are expected to stay off trails marked with “No Bicycle” signs. This provides trail walkers and hikers with a level of safety from encounters from fast moving bikes on narrow trails with restricted sight lines. As with visitors on foot, restricting bike use to officially marked trails reduces impacts to Fells natural resources. Due to the extreme wet conditions mountain biking is also restricted on unpaved trails from March 1 to March 31 and when posted as conditions warrant. Please report incidents of off-trail or unauthorized trail riding to DCR.